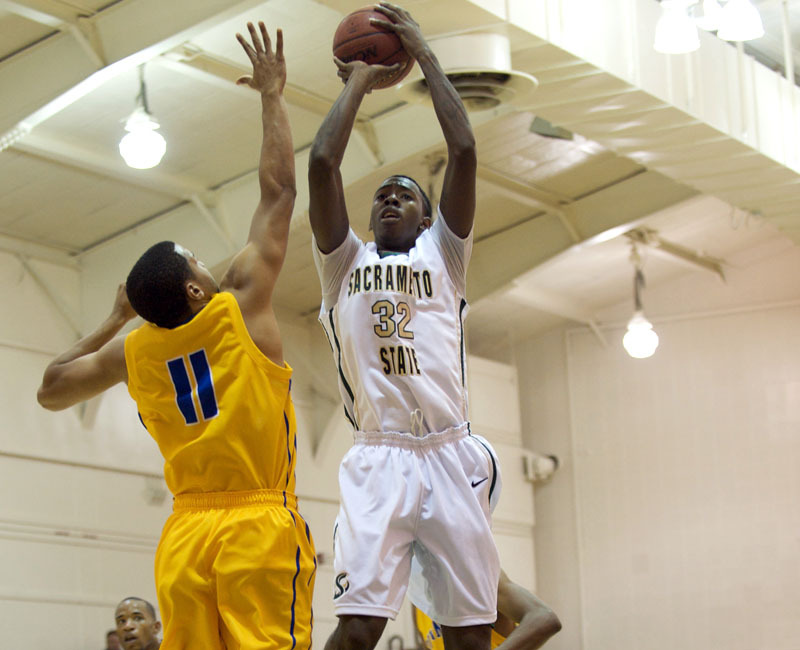 Big Sky Basketball: Where Will Sacramento State Get Their Offense From? Where Will Sacramento State Get Their Offense From? Last season Sacramento State had one of the worst offenses in the NCAA. Their AdjO of 90.1 ranked 319th in the country, and last in the Big Sky. Their EFG% was a dreadful 44.4%, 322nd in the nation. Their turnover percentage was 22.5, 293rd in the country. They shot 30.4% from 3-point range and 43.8% from 2s. They had an inordinate number of shots blocked. Other than that, their offense was just fine! After last season, their first and third leading scorers graduated (though I am not positive this is a bad thing. Leading scorer Sultan Toles-Bey shot 34% from the field - though in the interest of fairness he had an excellent 32.0 ARate), and their 5th and 6th leading scorers transferred. All of this begs the question - where are they going to get offense from? The guy that seems the best best to lead them in scoring is junior John Dickson, a 6'6'' forward. He was an honorable mention Big Sky performer, and finished 2nd on the team in scoring last year behind Toles-Bey. He scored 10.9 PPG for the reason, but upped that to a team-best 12.6 PPG during conference play. His best attribute is his ability to get to the line. He shot 139 FTs last year, making 76.3% of them, a solid number. If he can stay away from shooting 3s (5/39 last year) and focus on what he does best, he will be a nice building block for Coach Brian Katz. Another returner that will have a big role is Jackson Carbajal, who booked a lot of minutes last year as a freshman. At 6'3'' he will be handling the ball a lot, which may or may not be a good thing (had an almost 3:1 TO:A ratio last year). He took more 3s than 2s, but made 31% of 3s compared to 57% of 2s. He needs to take better care of the basketball this year, and he will likely be one of their leading scorers. Walter Jackson is another guy that put in solid minutes for them last year, though he was more of a selective scorer. He is a 6'5'' G/F combo that averaged 6.0 PPG last year, but did it with a very efficient 49% shooting (though he too needs to avoid the 3 ball). He is also a solid offensive rebounder, and his 8.7% OR% was highest on the team of anyone that played as many minutes as he did. He started 19 games last year, and should get a starting role again. Then, there are two newcomers who I think could have a big role in the offense. The first is Dylan Garrity, a 6'2'' G who averaged over 20 PPG last year in high school. He is a dangerous outside shooter, and I think could have command of the offense sooner rather than later. I am excited to see how he plays for the Hornets. Another key guy could be JUCO F Anthony Costentino, who scored 18.7 PPG last year. At 6'7'' he can play both forward spots, and his versatility will be key for a team without a ton of depth. He can score both inside and offense, and should be their best offensive threat down low. He should get all of the minutes he can handle right away. Who do you guys see as leading Sacramento State in scoring? Anyone I am missing that will have a big impact?